Keep It Local for the Holidays! Your food co-op works hard to support local producers. And your Neighboring Food Co-ops are proud to be working together to be make the bounty of our region’s farmers available year ‘round. As you shop for all the ingredients you need to make a delicious meal this holiday, don’t forget to check out the frozen fruits and vegetables from the Neighboring Food Co-op Association (NFCA). Since the launch of this project, food co-op shoppers have purchased nearly 20,000 pounds of Blueberries, Organic Broccoli, Organic Edamame, Organic Green Beans, and non-GMO Sweet Corn — all grown and packaged right here in the Northeast, and available only at your food co-op! As you celebrate with friends and family, we invite you to “Keep it Local” with delicious produce from our region’s family farmers! 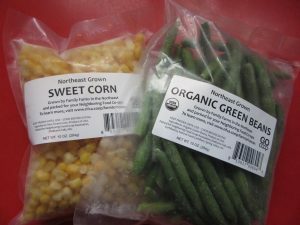 Look for our Northeast Grown Frozen Fruits & Vegetables in the freezer section. They’re easy to find because they’re packed in a clear package so you can see what’s inside! As a co-operative federation of food co-ops, the NFCA works with its members to identify opportunities for peer to peer networking that can contribute to shared success. 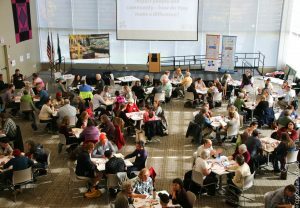 Most recently, more than 30 Finance Department Staff from 20 Neighboring Food Co-ops across the Northeast gathered for a day of relationship building, skills sharing, and workshops. The NFCA’s Peer Finance Department Training was hosted by Co-op Food Stores in Hanover, NH, and was built based on priorities identified by food co-op staff. As an introduction to the day, Dami Odetola, Vice President of the National Cooperative Bank, offered their perspective as partners and lenders to the food co-op movement, and the importance of measuring our economic impact. Bonnie and NFCA Executive Director Erbin Crowell then shared the NFCA’s work measuring and communicating the shared impact of food co-ops across the Northeast, and how these numbers can help us differentiate ourselves in a competitive marketplace. For example, the NFCA’s most recent survey found that our over 35 Member Co-ops and Start-Ups are locally owned by more than 130,000 people across the Northeast, generating $315 million in shared revenue, and purchasing $60 million from local suppliers, having a dramatic impact on our region’s food system and economy. Aaron Chase of ECRS updated the group on changes in the marketplace and how integrated software systems can help give co-ops an edge as they work to engage their members and shoppers in business success. Tim Wingate, CFO at Hunger Mountain Co-op, presented useful Excel tricks for finance staff, while Marty Huban of Brazee & Huban CPAs led a dialog on establishing and maintaining strong internal controls, changes in accounting rules, and best practices in financial reporting for Co-ops. The day concluded with food co-op staff sharing their favorite strategies for using financials to communicate the Co-operative Difference to members, shoppers, and the wider community. Examples included annual reports, newsletters, promotional materials, and round up programs that benefit community organizations. Special thanks to our sponsoring partners National Cooperative Bank, ECRS and Brazee & Huban, CPAs, for their support of this event, and to our hosts at Co-op Food Stores for their hospitality, Tim Wingate of Hunger Mountain Co-op for helping us plan the day, and to Equal Exchange for providing refreshment for attendees. The Neighboring Food Co-op Association (NFCA) was proud to co-host CDS Consulting Co-op‘s “Co-op Café” on November 4th at Greenfield Community College in Greenfield, MA. The event was a great opportunity to shine a light on how our food co-ops are empowering people to participate in positive impact in their communities, how people in different roles contribute to these efforts, and the support systems available to support people in doing this work. Sponsored by National Cooperative Bank and National Co+op Grocers, the Co-op Cafés are regional events designed to bring food co-op boards members, staff, and management together for a focused day of dialog on themes relevant to food co-op success. For photos from the day, please visit the NFCA’s Facebook page: www.facebook.com/neighboring. The J. Kevin Crocker Scholarship Fund for Education in Co-operative Enterprise honors UMASS Amherst Professor’s service, dedication and contribution to co-op education. Education is a basic Principle of the Co-operative Identity, recognizing that our ability to empower people more in their economic lives depends on engaging “the general public — particularly young people and opinion leaders — about the nature and benefits of co-operation.” But despite the substantial impact that co-ops have on our economy, there are only a handful of opportunities for students in our colleges and universities to study, learn about, and engage with the co-operative movement. The University of Massachusetts, Amherst, is an exception. Home to one of the oldest and largest systems of Student-Run Co-ops, UMass also boasts a number of courses and programs that include co-operative enterprise. And in 2010, the Neighboring Food Co-op Association (NFCA) and the Valley Alliance of Worker Co-ops (VAWC) worked in collaboration with the Department of Economics to launch a “Certificate in Applied Research on Co-operative Enterprise.” The program includes internships where students can gain hands-on experience with local co-ops that are part of the NFCA and VAWC co-operative federations. Host co-ops, meanwhile, gain the insights of students exploring co-operative enterprise and how they can be more successful, resilient, and relevant to contemporary challenges and opportunities in the economy and society. The success of this program is thanks to a spirit of innovation and collaboration among academics, students and co-operative practitioners at the University. And one of the key leaders in this effort is J. Kevin Crocker, a beloved long-time member of the Department of Economics at the University of Massachusetts, Amherst. In honor of Professor Crocker, Adam Trott, Executive Director of VAWC, and Erbin Crowell, Executive Director of the NFCA, announced that their organizations, in collaboration with the UMASS Department of Economics & the New England Farmers Union, had established the J. Kevin Crocker Scholarship Fund for Education in Co-operative Enterprise to support undergraduate internships with their associated co-operative enterprises through the UMASS Department of Economics Certificate in Applied Economic Research on Co-operative Enterprises. At the ceremony honoring Kevin’s distinguished services to the University, coworkers shared their appreciation of Kevin’s commitment to the Economics Department, his colleagues, and students. Accompanied by his family, Kevin shared his journey to the UMass Department of Economics, including his experience working with Pelham Auto, a worker co-op and auto repair shop in nearby Belchertown, MA. “It may have been the only garage with a portrait of Karl Marx on the wall!” he joked. 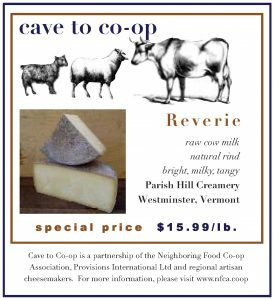 November’s special cheese is “Reverie” from Parish Hill Creamery in Westminster, Vt. Delicious as a table cheese and on a cheese plate, Reverie can also be used to make some pretty delicious food. A week ago, the U.S. Department of Agriculture (US DA) announced it would delay the implementation of the Organic Livestock and Poultry Practices final rule. This is the third such postponement, the first two of which occurred in February and May. It is now due to take effect on May 14, 2018. The rule has received predictable opposition from some groups, who say it would arbitrarily change and complicate farmers’ and rancher’s current practices at unnecessary cost. Other groups, like the Organic Trade Association, have strongly advocated for its passage, even suing the Trump administration for its delay. The organization said the lawsuit was intended to “uphold the integrity of the organic seal and to honor the consumer trust in that seal.” Indeed, by some accounts, the vast majority of consumers think that the organic label should incorporate animal welfare standards, while many incorrectly conflate the two. Earlier this year, NFU voiced support for the rule, citing its ability to quell consumer confusion and standardize the application of animal welfare standards. “Food producers and consumers alike benefit from thorough, accurate, and consistent food labeling,” said NFU President Roger Johnson of the bill. In other organic news, earlier this month, after decades of debate, the National Organic Standards Board (NOSB) decided that “soil” did not need to be included in the definition of organic, thus allowing soilless hydroponic and aquaponic facilities to maintain their certification. The New Food Economy covered the controversy in great detail – read their account here. City Market/Onion River Co-op Opens South End Store!